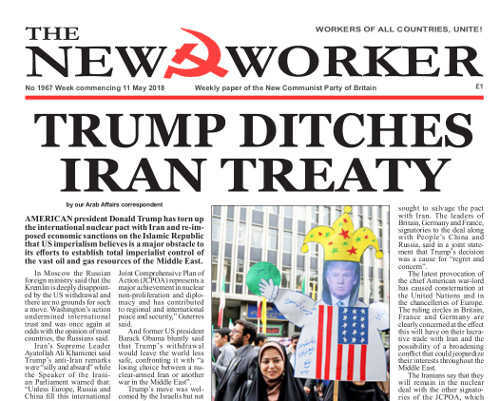 AMERICAN president Donald Trump has torn up the international nuclear pact with Iran and re-imposed economic sanctions on the Islamic Republic that US imperialism believes is a major obstacle to its efforts to establish total imperialist control of the vast oil and gas resources of the Middle East. In Moscow the Russian foreign ministry said that the Kremlin is deeply disappointed by the US withdrawal and there are no grounds for such a move. Washington’s action undermined international trust and was once again at odds with the opinion of most countries, the Russians said. Iran’s Supreme Leader Ayatollah Ali Khamenei said Trump’s anti-Iran remarks were “silly and absurd” while the Speaker of the Iranian Parliament warned that: “Unless Europe, Russia and China fill this international vacuum, the Islamic Republic will bring him to his senses with its nuclear measures.” And defiant Iranian MPs, chanting “Death to America” burnt an American flag inside the Iranian Parliament while it was in session. Windrush: Repeal the 2014 Immigration Act! Read the full story here >> Windrush: Repeal the 2014 Immigration Act! OVER the last two decades there have been a couple of attempts by Tory and Blairite Labour governments to introduce compulsory ID cards, but both were opposed by civil liberties campaigners and were dropped as unworkable. But that does not mean the ideas have gone away. As the class struggle sharpens and wealth of the world is accumulated by a smaller and smaller group of super rich parasites, from their lofty perches they can see the vast gulf between their lives and ours yawning and they grow insecure, knowing that sooner or later we will rise up and they will fall. And so their desire to control us and divide us becomes a desperate obsession and they devise all sorts of ways of introducing controls by the back door. And they want to introduce systems whereby they can micromanage our lives and behaviour with punishments and rewards. They want us to accept the concept of ID cards in the way that a horse is taught to accept a bridle or a dog is taught to accept a collar and lead. And lately they have been demonstrating to us just how awful life can suddenly become for those who do not have the right identity documents.